The Munich Security Conference is celebrating its 55th birthday. Long a fixture on the security conference circuit, it takes place in the rather dated grandeur of the Bayerischer Hof Hotel. While Russian and Chinese spokesmen attend, it is essentially a forum for Europeans and Americans to renew their security vows. In the press centre along with the cold drinks, newspapers, worthy reports and so on, there are some small boxes containing a jigsaw puzzle. A rather dull picture of the conference hall is broken up into 55 pieces for 55 years for anyone who wishes some distraction from the speeches. The puzzle is perhaps an unintended metaphor for the state of the North Atlantic Treaty Organization (Nato). It is beset by problems; something which the German Chancellor Angela Merkel, on probably her last visit here while in office, made abundantly clear. Can Nato survive President Donald Trump? With a deadline fast approaching for the US Department of Commerce to submit a report on proposed tariffs against imported cars, Mrs Merkel said such a prospect was frightening. She called for proper talks on the matter. The US report is being drafted in the light of legislation that allows for the provision of tariffs against goods that might be a threat to US national security. The German chancellor was blunt. She noted, for example, that BMW's largest plant was actually in the US state of South Carolina, from where many of the vehicles were exported to China. Is this really a threat to US security, she asked, rhetorically adding: "It's a bit of a shock to us!" But the tariff battle is just one of a raft of issues here in Munich that are causing tensions between the Trump administration and its European allies. Mrs Merkel questioned if now was the right time to be thinking about pulling troops out of Syria as President Trump proposes to do once the battle against the Islamic State group is won. She disagreed with the Trump administration's efforts to pull the plug on the nuclear agreement with Iran, asking whether this really was the best way to deal with its negative behaviour in the region. 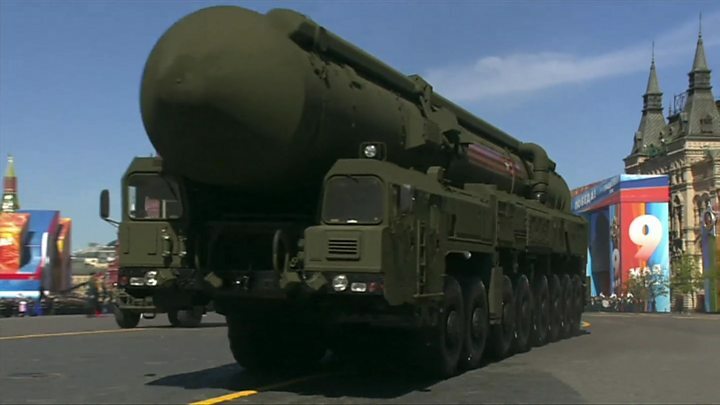 And she expressed disappointment about the collapse of the Intermediate-Range Nuclear Forces (INF) treaty. She accepted that after "years of violations" by the Russians there was probably no alternative. But many here feel that this is a treaty with huge significance for the Europeans, who have really had no say about its demise. 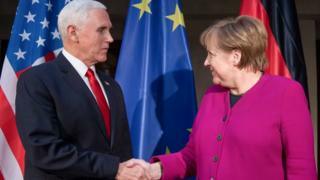 Next up was US Vice-President Mike Pence, who attempted to build a convincing case for President Trump as the leader who was galvanising the western alliance to face new challenges. For a time he seemed to be presenting the "glass half-full" case; praising, for example, increased defence spending among many European Nato countries. But inevitably he returned to the issues that divide many European capitals from Washington. Just as in his recent Warsaw speech, he condemned the EU once again for seeking, in his view, to undermine sanctions against Iran. He urged the Europeans to walk away from the nuclear agreement with Tehran. He criticised those Europeans who are still going ahead with the Nord Stream 2 gas pipeline from Russia that bypasses Ukraine. Implicitly, his sights were on Germany. How different then when the veteran Democratic politician and former Vice-President Joe Biden came to the podium. He was introduced by an almost gushing Nicholas Burns - the former senior US diplomat (and no supporter of Mr Trump) - who mused (to rapturous applause) on how nice it would be if the US had a leader who, "rather than embracing Kim Jong-un or Victor Orban would have embraced our true friend Angela Merkel". Listening to Mr Biden's speech, I searched for hints as to whether he would make a run for the White House. He was certainly a candidate for many people in the room. In a blunt reference to President Trump, he said: "Leadership in the absence of people who are with you is not leadership." He spoke of a "struggle for America's soul". The majority of Americans wanted the US to take an active role in world affairs, he insisted. "This too shall pass," he asserted, "We will be back." Was that the hint? Mr Biden is not going to announce his presidential bid in Munich, but if the applause was anything to go by, he would clearly be the Europeans' favourite over Mr Trump. But the fact is that the current president is in office for two and possibly six more years. He has altered the landscape of the trans-Atlantic relationship at a time when the institutions of the liberal international order (of which Nato and the EU are key building blocks) are facing new challenges both from within and from outside. There are, if you like, two Americas here in Munich represented by the current and former vice-presidents. The Europeans are nostalgic for one and remain deeply uncomfortable with the other. Can Trump's Syria policy end the 'Forever Wars'?